Special counsel Robert Mueller’s team interviewed White House chief of staff John Kelly about obstruction of justice as it relates to President Donald Trump and those close to him, sources with direct knowledge of the matter told ABC News. As ABC News has previously reported Kelly was among members of the administration and those outside advisers close to the president who have been interviewed by the special counsel, according to sources over the course of the investigation. 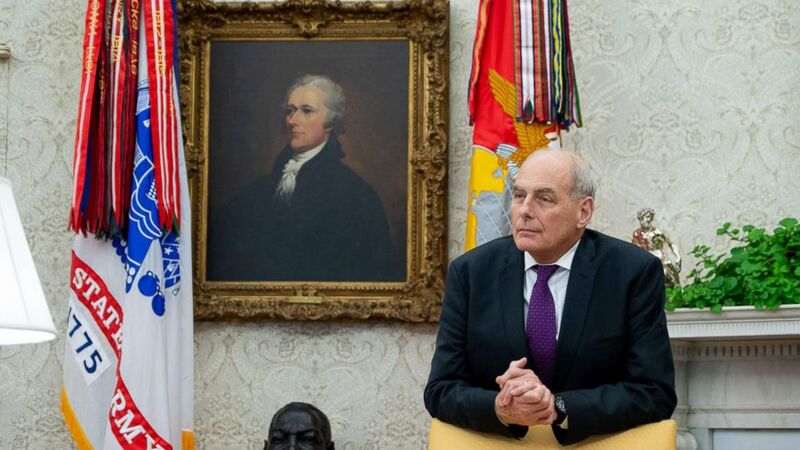 White House Chief of Staff John Kelly stands in the Oval Office of the White House in Washington, Nov. 16, 2018. Kelly’s interview with the special counsel’s team was first reported by CNN. Kelly, who signed on as President Trump’s chief of staff in July of 2017, joins a long list of current and former White House officials to have interviewed with Mueller. President Donald Trump speaks with newly sworn-in White House Chief of Staff John Kelly at the White House in Washington, July 31, 2017. Since his appointment as special counsel, Mueller has met with the president’s son-in-law, Jared Kushner; former legal counsel Don McGahn; former communications director Hope Hicks; senior aide Stephen Miller; former press secretary Sean Spicer; and Kelly’s predecessor, former chief of staff Reince Priebus, according to multiple sources with direct knowledge. White House Chief of Staff John Kelly listens to President Donald Trump during a working lunch with governors in the Roosevelt Room of the White House, in Washington, DC, June 21, 2018. The president recently responded in written testimony to a slew of questions posed by Mueller and his team of prosecutors. ABC News has previously reported that the questions, which were divided into five sections, focused mostly on whether there was collusion between the Trump campaign and Russia during the presidential campaign cycle, according to sources.